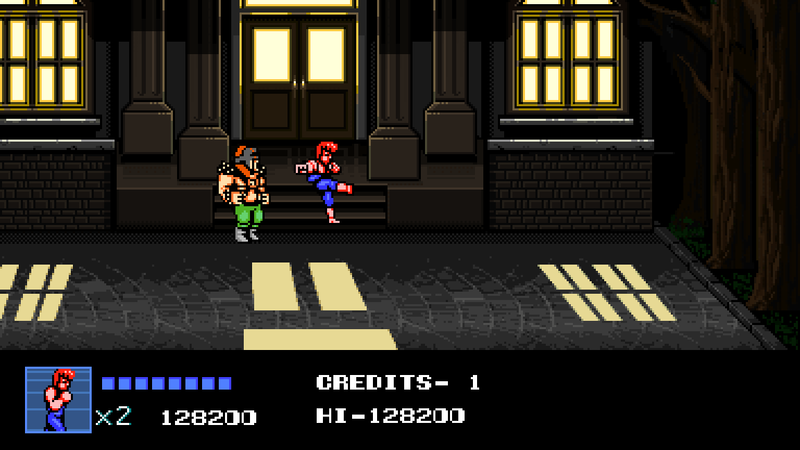 Double Dragon IV takes the same route as Capcom’s Mega Man 9, released almost a decade prior. 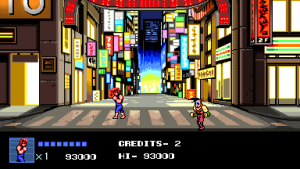 It’s a “new” entry in the series that disregards everything that came after the NES games as spin-offs, and presents itself as a true sequel in the style of the retro games. 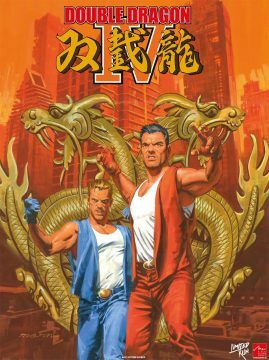 (After all, the SNES game was technically never called “Double Dragon IV” and Double Dragon V didn’t come out in Japan.) 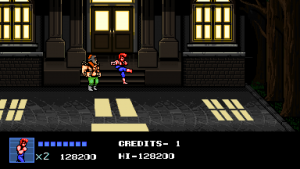 It was released for Double Dragon’s 30th Anniversary, with a staff that makes it seem like the most authentic entry since Double Dragon Advance. It was directed by Yoshihisa Kishimoto, with art and music by Koji Ogata and Kazanaka Yamane, respectively, two of the guys from the old Technos days. 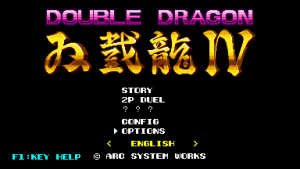 And it was primarily developed and published by Arc System Works, known for their line of high-quality of fighting games (and also tied into the history of Double Dragon, since their SMS port of the original game was one of their first projects). 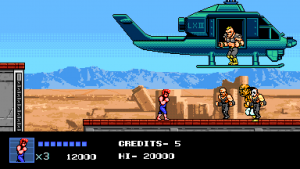 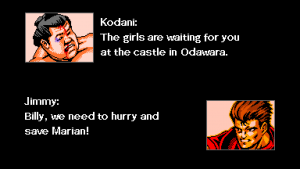 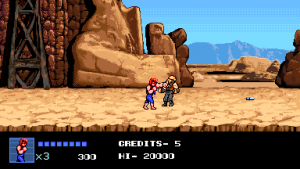 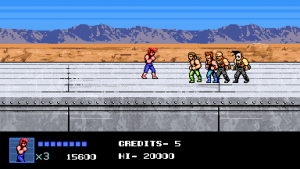 Like some of the more modern Double Dragon games, there are cutscenes at the beginning and between levels, detailing Billy and Jimmy Lee’s trek across the globe to save Marian. 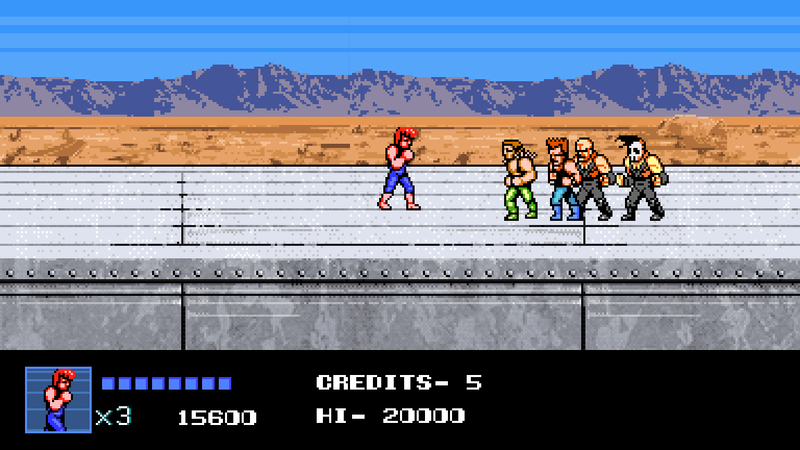 The game begins in the desert before heading to a Vegas-like casino, before they hop on an ocean liner to head to Japan. 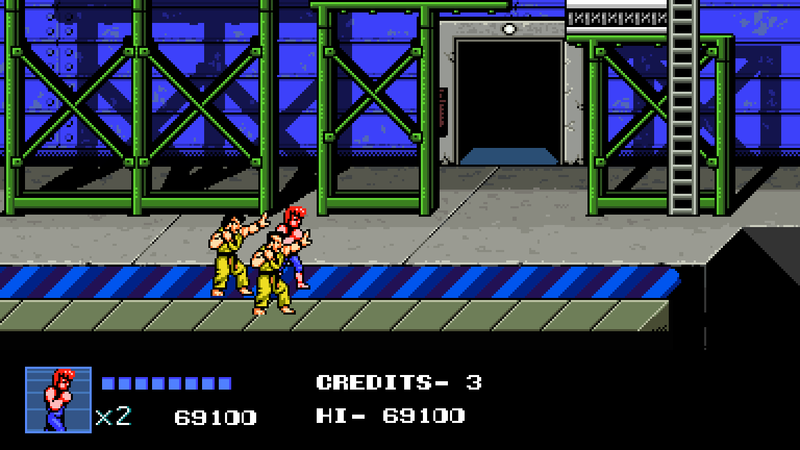 Much like Mega Man 9 hearkened back to Mega Man 2 (perceived by the developers to be the best / most popular entry), Double Dragon IV patterns itself most closely after the NES version of Double Dragon II. 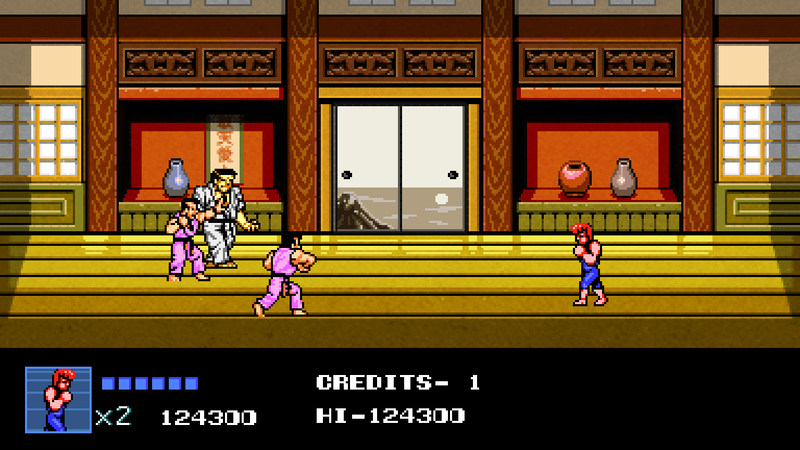 It looks and feels very similar, though it ditches the forward/back command scheme for the typical punch/kick, and finally has a separate jump button. 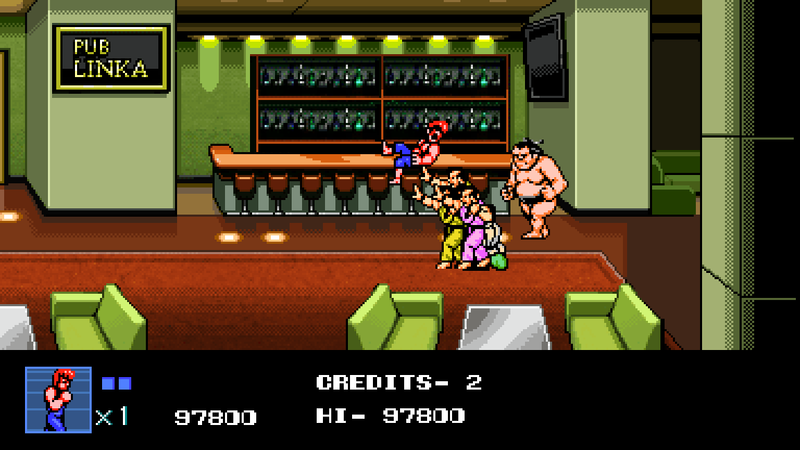 There are lots of classic enemies, but plenty of new ones, including some masked goons, a sumo wrestler, and some ninja ladies. 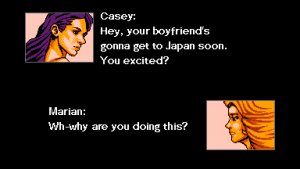 The penultimate villains here are Casey and Shannon Okada, sisters who are sort of like evil female counterparts to Billy and Jimmy. 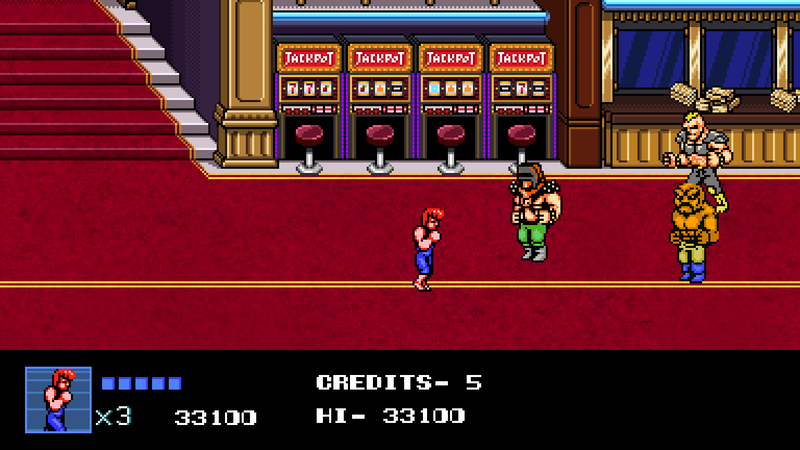 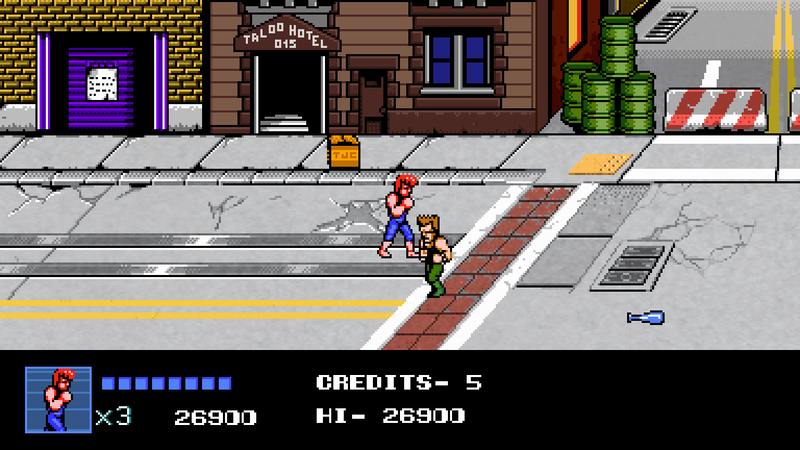 Even though the basics in place are fine, there’s a lot about Double Dragon IV that just seems…off. 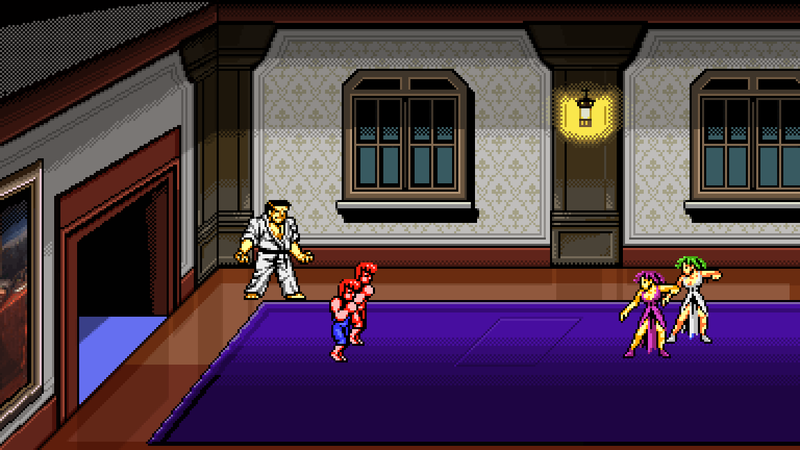 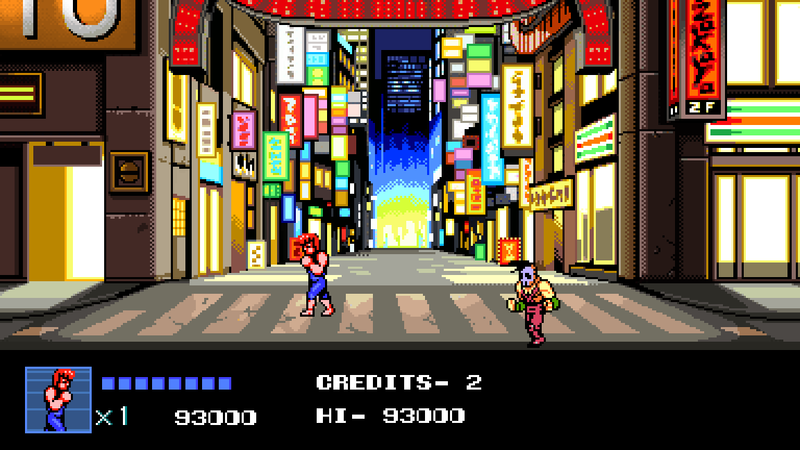 It uses a modern widescreen presentation, but many of the sprites are simply ripped from the NES games, so they feel small against the gigantic playing field. 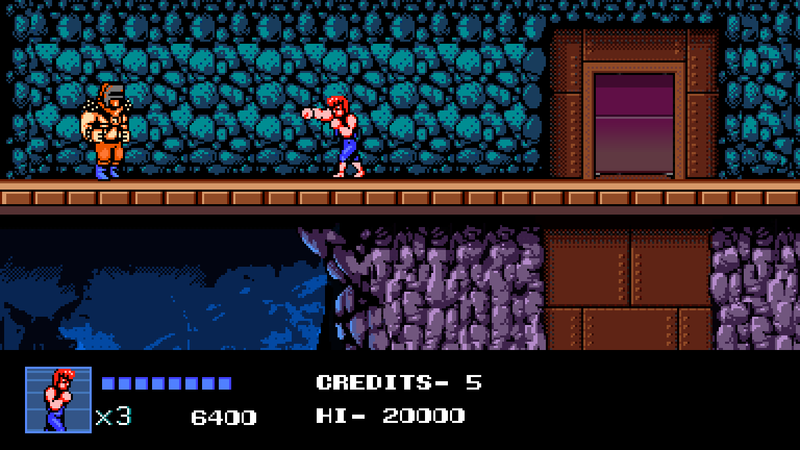 The backgrounds are drawn in an 8-bit style, but still more complex than the NES could ever handle, both in their tiling and their color scheme. 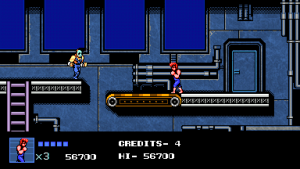 The soundtrack uses some blaring synth that sounds terrible – there’s an option for an NES-style rendition, which is much more appropriate, but it should’ve been the default. 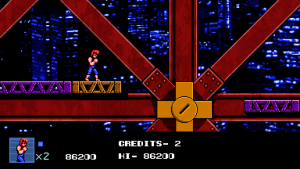 There isn’t any boss music, which make the stage ends feel like they come out of nowhere, and even the little “go” arrow is missing sound effects. 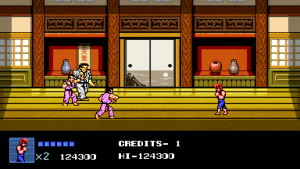 Some of the moves are easier to execute, and generally more powerful. 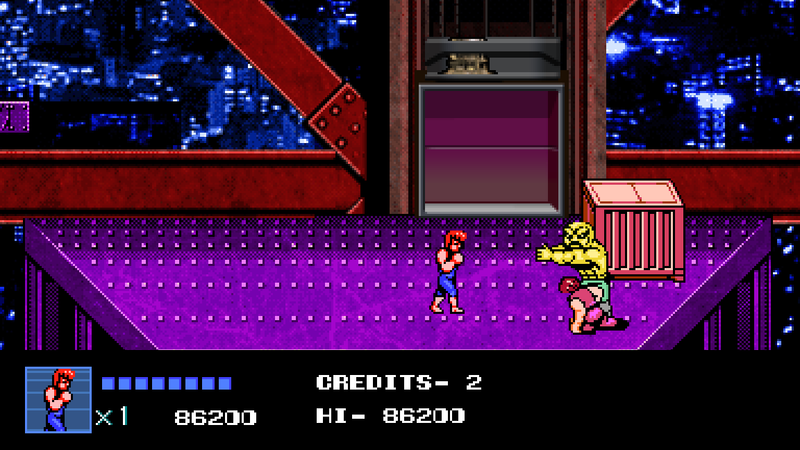 Enemies never duck under the cyclone attack like they used to, and the knee attack is so easy to use that you can just keep hitting the kick button over and over, rather than needing to time it right. 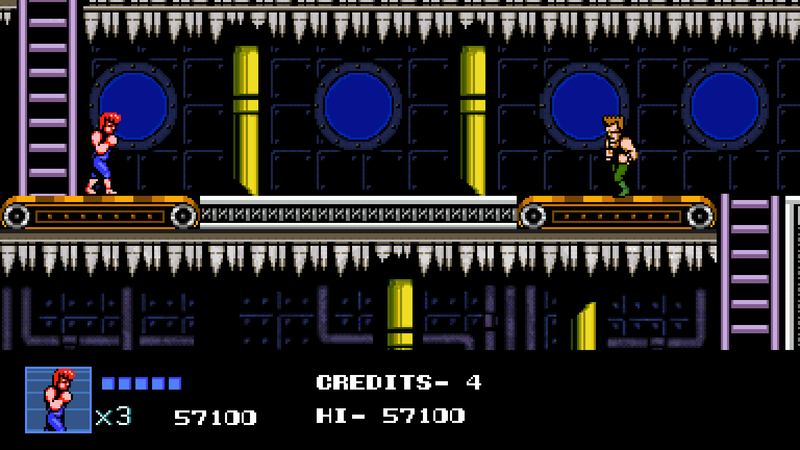 There are a few new attacks too, like a leaping, spinning torpedo attack. 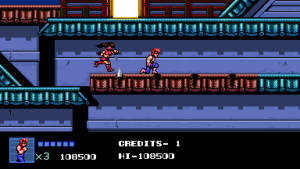 All of these powerful moves have the effect of making the early stages feel fairly boring, since you can crush right through them, but the later stages are more difficult due to the vicious AI. 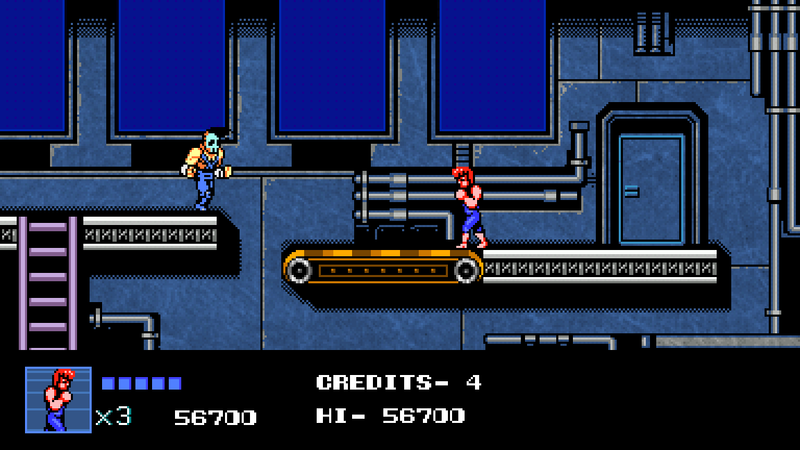 With three lives and five credits, it seems to be balanced so that you can get to the end of the game (but not beat it) on the first try. 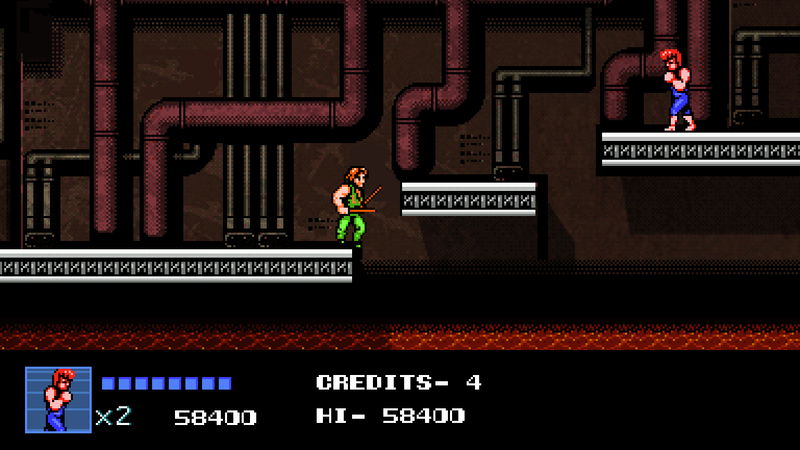 There is a hidden level select that lets you resume at the last level you beat, in case you can’t do it all at once. 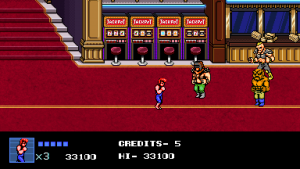 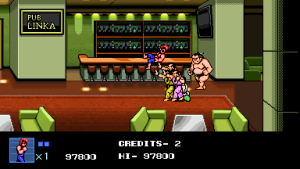 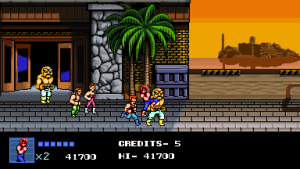 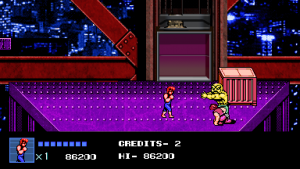 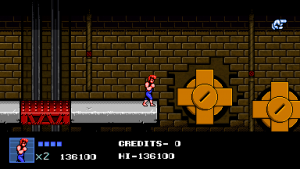 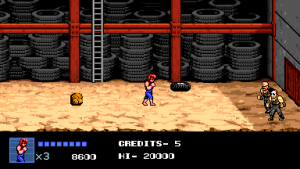 There are twelve stages, but each are shorter than a regular Double Dragon stage – in total, it’s only slightly longer than the NES Double Dragon II. But it feels lengthier, since most of the stages are lacking interesting gimmicks – there’s nothing like the helicopter or train fights. 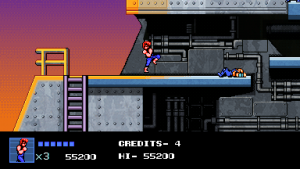 There are a few breaks for dodging columns (in the ship’s interior, for some reason) or jumping on moving platforms, but these were never anyone’s favorite parts in the old games. 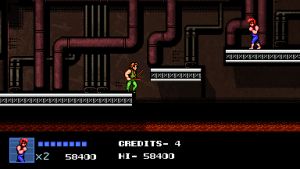 Indeed, one of the major issues with the game is that it’s presented in a retro style but it doesn’t seem like the anyone really learned anything since the old days. 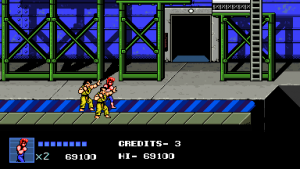 Despite outward appearances, Mega Man 9 and 10 were more smartly designed than many of its 8-bit predecessors, but Double Dragon IV actually feels more stripped back in a lot of ways, despite the easier controls. 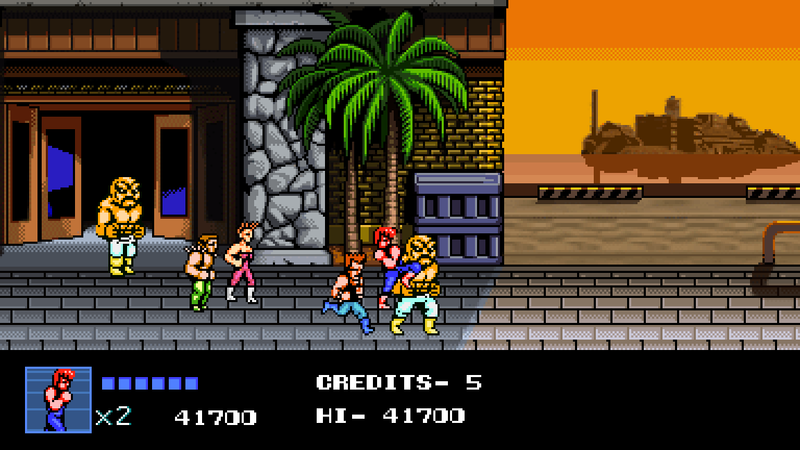 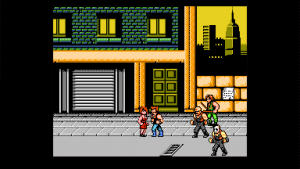 About the only real benefit – an aspect borrowed from the later ports of the original Double Dragon – is that you can unlock all of the enemies as playable characters. 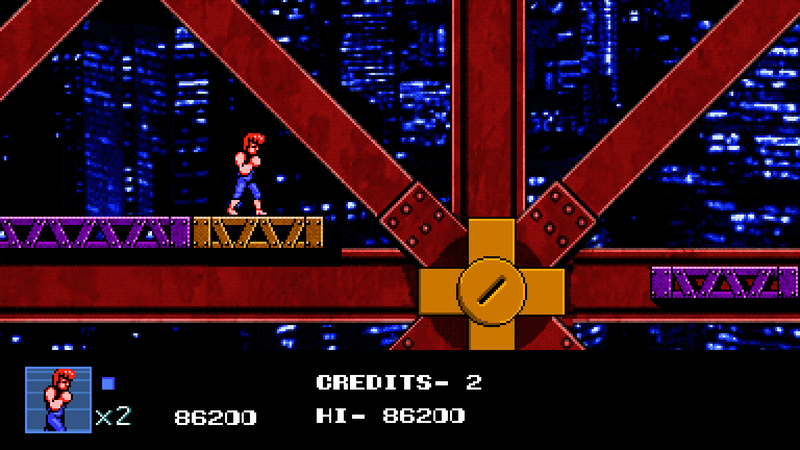 This is done first in the two player Duel mode, though after beating the game, you unlock the Tower, which is basically just an unending survival mode. 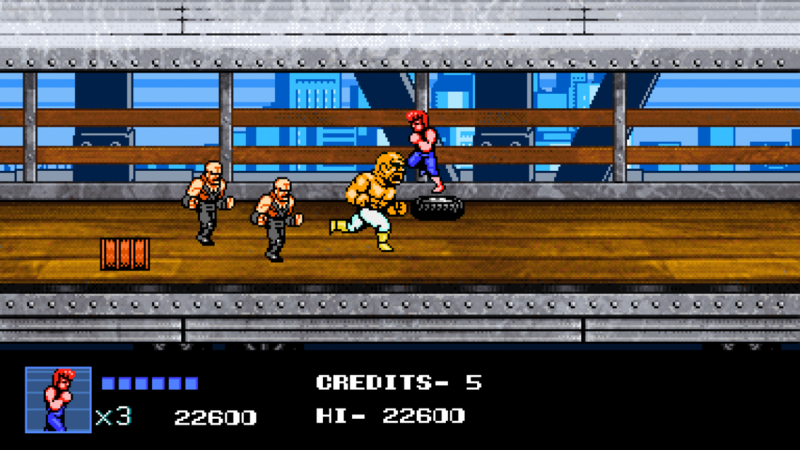 As you make your way up the floors of the Tower, you unlock more characters, this time for the main game including the other guys from Double Dragon III, as well as the boss from Double Dragon II. When taken discretely, Double Dragon IV’s problems aren’t major, and even when considered together, they don’t even really make it a bad game. Consistency has never been a quality of Double Dragon and there are certainly worse entries. 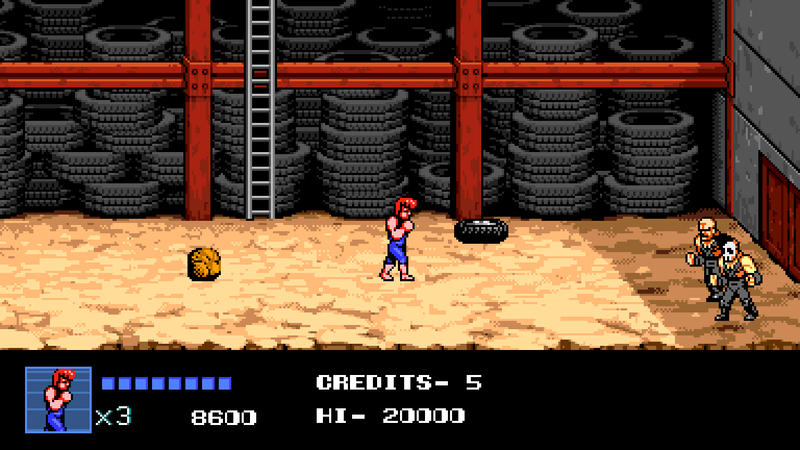 But it easily the laziest one, something that was obviously cobbled together on the cheap as a simple cash grab. 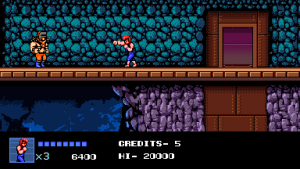 It was released for only $7, and clearly no one was going to get rich off of this, but it could’ve benefited from substantially more care in basically every aspect. That rushed quality is obvious due to various technical issues. 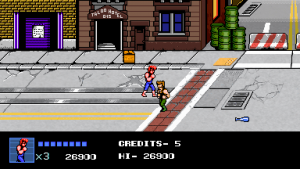 The PlayStation 4 version is the worst of it due to screen tearing. 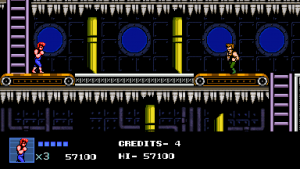 Yes, there are vertical sync problems in an entirely 2D game designed to look like something from 1989. There are also crashing glitches, plus some of the sound effects are messed up. 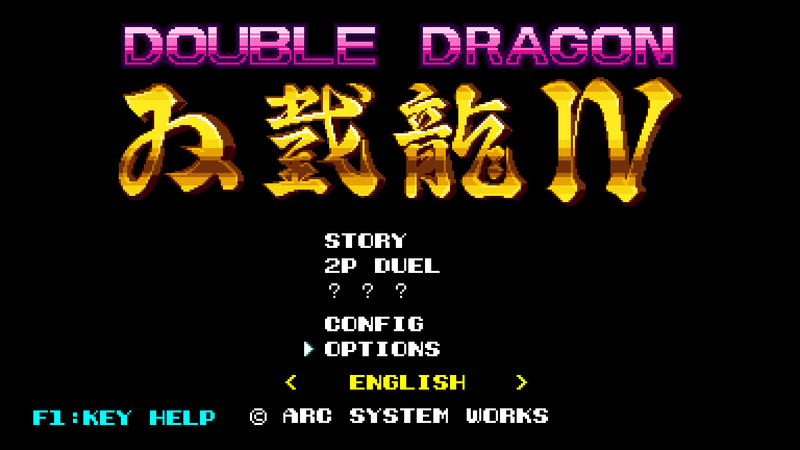 These issues are fixed in the Windows release, but this was also evidently slapped together without much care. 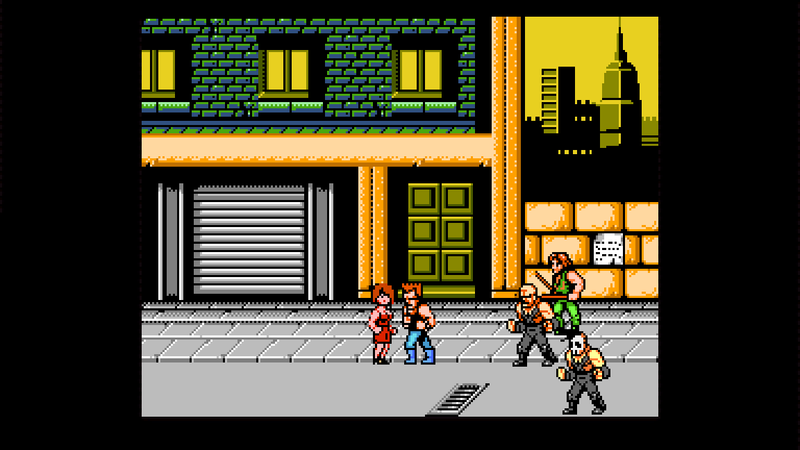 The game begins displayed in a window and there’s no obvious way to make it full screen (hit F2). There’s no way to quit, either, other than resizing the game window and hitting the “close” button on the corner of the window, or other similar methods. 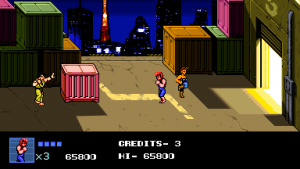 The Switch version lacks the PS4’s technical issues, but only the PS4 version got a retail release, courtesy of Limited Run Games.